Highly energy efficient due to its thermal break technology, aluminium stone mullion windows convert draughty old period properties such as cottages, churches or village halls into usable social areas without compromising on traditional aesthetics. 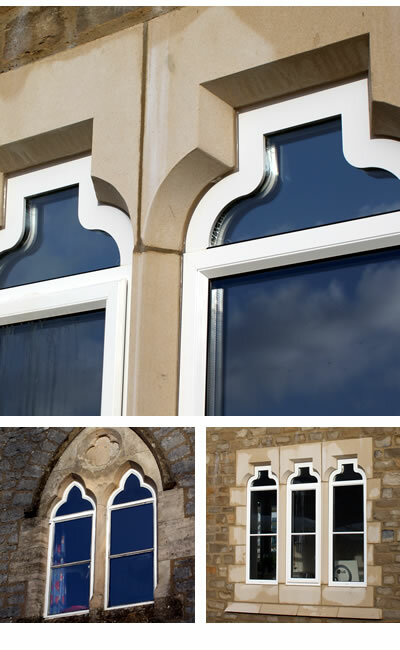 Our mullion windows meet building regulation requirements for listed buildings and conservation areas. Aluminium is in high demand as a replacement window for old steel or crittall windows – no other window material combines the thermal efficiency of double glazed units with a sleek metal appearance. Keep reading for product specifications for aluminium stone mullion windows or read more about buying from Amberley. Our stone mullion windows come in 47mm equal or odd leg frames, which fit rebated or ‘straight through’ traditional stone mullion profiles for a weatherproof fit, slim sightlines and opening aperture width to allow egress through window when fully open. High levels of ventilation are achieved through colour matched trickle vents on the head of the opening sash and the internal leg of frame. Stone mullion windows can be easily face drained to remove any residual water with the fitting of stone cills or low profile stub cills. Slim face mounted astragal bars can be fitted inside and out to provide traditional Georgian bar effect, matching the colour of the window frame. Steel look windows are available in any standard RAL, British Standard or silver anodised finish, in single or dual colour.